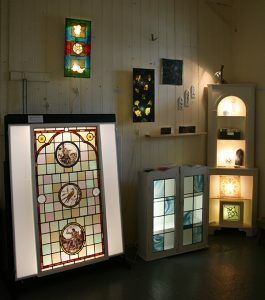 Our studio was was set up in 2011, predominantly providing stained glass services. Since then, our activities have diversified and we now also design and make artwork for interiors and outdoor spaces. 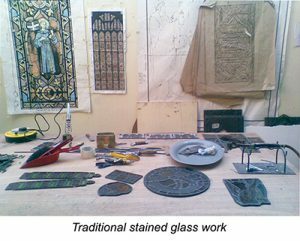 Our services include leaded-lights, kiln-firing (painting & printing, casting, fusing & slumping), stained glass restoration, and cold-working techniques such as sandblasting, etching, gilding; model and mould-making, ceramics and mosaic. We make beautiful and unique artwork that will stand the test of time, whether it is a simple paperweight to a large-scale commemorative window. Our level of input varies; from making a simple replica piece for a lantern or cabinet to providing a full design, production and installation service. We can suggest ideas and techniques for your project and provide technical drawings and coloured sketches/mock-up images for you to approve before fabrication. To view samples and to discuss potential projects please contact us to arrange a visit. Decorative glass can also be bought from our collection, please have a look at our events page to see where we are exhibiting or visit the studio to view our work. 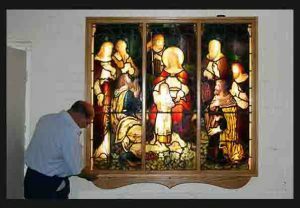 We also carry out glass-painting and kiln-firing for other companies, for example in the restoration of historical glass. We collaborate with other professionals and artisans to successfully complete projects to a high standard. 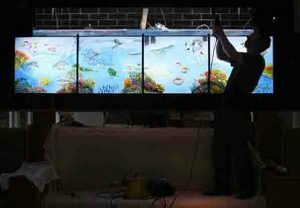 Our associates include joiners, electricians, glaziers, ceramicists, blacksmiths, prop-and model-makers (GRP, plaster-casting etc) so not only can we can display and install glass artwork effectively, meeting current buildings and safety regulations, we can also provide artworks made using other materials.